Bryan Whitby features a nice USB Chess Board website with a lot of information and links on USB chess boards. 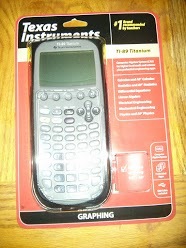 On this site, you can find details on hardware and software for connecting a chess board to a tablet or computer. A must read for anyone who enjoys playing computers but prefers playing on a real board. I, obviously, especially liked the video of Frank Walls Android USB board that features Chess for Android. I have embedded the video below. Gerhard Roth wrote various very interesting chess OCR applications that enable you to scan chess positions from books and open these directly in your favorite chess application for further analysis. Much faster than manually entering these positions through a position setup editor. The application supports the Android sharing mechanism I blogged about a while back. For example, as illustrated below, first open a chess book at an interesting position, then invoke Gerhard's OCR application to scan the position, and finally select sharing to open, for instance, Chess for Android for further analysis with your favorite UCI or XBoard engine. 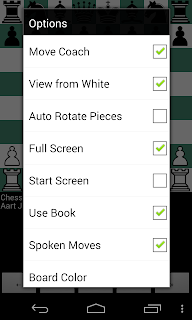 It has been a while since the last update, since I have been a bit busy at work, but I finally had some time for two new features in Chess for Android, version 4.5 now available through the playstore or as direct download: Spoken chess text (option to announce all moves)Retrieve position function (direct link with Gerhard Roth's OCR app) To enable the new chess speech feature, simply press the menu button, select "Options", and then enable the "Spoken Moves" option (see check-mark below). After that, Chess for Android announces the chess moves made on the board, as well as the final outcome of the game. For now, only the english language is supported. A follow-up posting will go into more detail on the OCR feature. 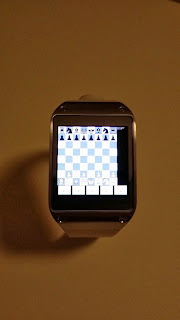 A few days back I got a very kind email from Branko with some pictures of Chess for Android running on a Galaxy Gear smartwatch. I never tested a much smaller screen, and was glad the scalable drawing methods displayed the board rather well. Thanks Branko for these pictures and your nice email! Because the 26mm eyepiece does not fit in the Meade basic camera adapter, and the 9.7mm eyepiece has too much light loss in my modest Meade ETX-90EC, I purchased a 15mm eyepiece. This eyepiece fits comfortably in the adapter. Less magnification than the 9.7mm eyepiece, of course, but therefore also less light loss. Below already a quick result (taken at dawn) together with two pictures from the September 7 posting (taken during the day) for comparison. The slight curvature in the picture is a bit worrisome, still have to look more into that. 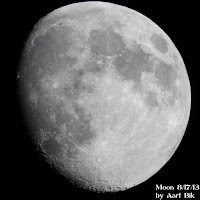 Can't wait though to try some real astrophotography with the new eyepiece. I have completed the initial tests for the 2013 tournament between engines for Android (compiled for ARMv5TE) using Chess for Android on a Nexus 7 (1.3 GHz quad-core Cortex-A9). The qualified and disqualified engines are shown below. Next to follow is a qualification tournament which will place the top 25 engines in six groups, like I did in the 2011 tournament. However, I will wait a few days to see whether engine authors want to appeal the disqualification with an improved binary. Updates of qualified engines are of course also welcome. My 2013 tournament between UCI and XBoard engines for Android (ARMv5TE-based) using Chess for Android is about to start with the test and qualifying rounds. I have setup a tournament website with past tournaments (one old, one new so far). The new tournament results will be posted in this blog and at the 2013 tournament site. Games will be played on a Nexus 7 (1.3 GHz quad-core Cortex-A9). If supported, engines will be allowed to use multi-threading. Let the games begin! If you don't see your favourite engine in the test tournaments, feel free to drop me a request. I just released version 4.1.5 of Chess for Android as direct download and at Google Play with enhancements for, what I like to call, the chess ecosystem on Android. First, as explained in my prior blog posting, Chess for Android now understands a few more direct sharing requests from other applications so that, for example, a game can be shared directly from Gerhard Kalab's Chess PGN viewer into Chess for Android, without going through tedious copy-and-paste operations. Conversely, Chess for Android now supports the "Share Game" feature as well to do the opposite operation. As illustrated below (long-press notation window to open the extended menu), exporting a game from Chess for Android to the Chess PGN Viewer now only takes a few simple clicks! In January 2012, I posted a blog entry on registering Chess for Android as viewer for the application/x-chess-pgn MIME type. Under this approach, when an Android application requests viewing a game in PGN format, Chess for Android will open that game. If several programs register as viewer, the user can select what program should be used. Recently, I got an email from Gerhard Kalab, author of Scid on the Go and Chess PGN Viewer, with a request to support the application/x-chess-pgn MIME type for data sent through an Intent.EXTRA_TEXT as well. 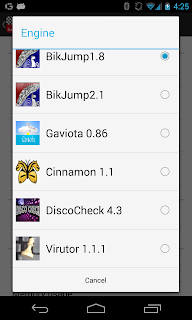 After adding this feature, Gerhard's viewer can now share a game with Chess for Android, as shown below. For example, to share a game from the Chess PGN Viewer, press menu, select "Share", and then "Share game". This lists possible target programs, including Chess for Android. Picking the latter opens Chess for Android with the currently viewed game. Nice to see the Android chess ecosystem develop more and more!